At Dublin electricians we are experts in all types of domestic electrical services. It may be that you would like to upgrade those grubby old white socket covers to brand new shiny chrome ones, or it could be that you require your house to be rewired. Whatever the job Dublin electricians are perfectly placed to provide the best services possible whatever your needs. All of the work we taken on is completed by our team of RECI accredited electrical engineers. 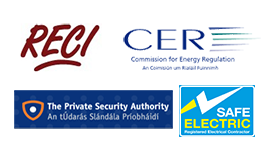 Dublin electricians routinely perform the following electrical installations. Adding or replacing new sockets within an existing circuit. Replacing all colored accessories, for example switches or light sockets with new modern metallic or brightly colored types. Upgrading lighting from a pendant to down lighting. Wiring and installing of new circuits for electric cookers or showers. Bathroom rewiring including shaver sockets, electric showers and lighting. Installing of all types of outside sockets. Full kitchen rewiring, this can include sockets, fused switches for appliances and circuits for lighting and cookers. Installing and testing Fire alarms. New wiring for loft conversions. Complete room rewiring and renovations. Complete, garage, house or apartment rewiring. These are just some of the electrical installations that Dublin electricians can provide. If you don't see your requirement on our list don't panic we'll still be able to do the job. All of our team are fully qualified and RECI accredited and for you extra assurance we are completed protected by both public and professional indemnity insurance to the value of €13.5 million. As we realize we provide the highest standards of workmanship at the most competitive prices we stand by our work. This means we guarantee it for parts and labor for a year. For a free quotation without obligation or for friendly expert advice call your local Dublin electrician today on 01-6874854.